Another event? Yes! It's Sugar High Fridays - and this time, it's hosted by Andrew from Spittoon and Spittoon Extra. Theme? Dairy. So, what to make? I opted for a dairy-heavy dessert, Crème Brûlée. 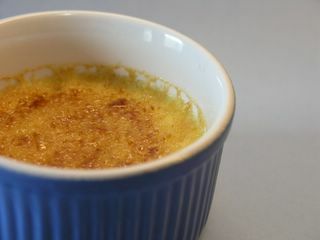 This lovely French concoction can be flavored with almost anything - but simple is best, and what's better than vanilla? Right, not much. Preheat your oven to 170°C, and put in a deep roasting pan with 1-2 cm of water in it. Bring milk and cream to a boil. Cut open the vanilla bean, and scrape out all the little seeds into the cream-milk. Let the vanilla bean infuse for ten minutes or so. Discard. Meanwhile, beat the egg yolks and the sugar. Pour the hot cream-milk over it, beating all the time. Pour into small ramekins, and place these very carefully in the roasting dish. Bake for about 45 minutes. Custards will still be quite wobbly. Turn off the heat, and leave for another ten to fifteen minutes. Remove, let cool, and place in fridge for at least four hours or overnight. When ready to serve, cover the surface with unrefined golden sugar, and get out your tiny (or big!) torch. Scorch the surface until caramelized. I have to make this sometime soon. I even have the individual ramekins to make it in. Classic! I could go for some now. Yum! Andrew, of course :) I'm getting ready.. slowly.